In pointing out that F1 is a balance between driving skills and technological expertise yesterday, I gave the story very much from the F1 enthusiast's point of view. 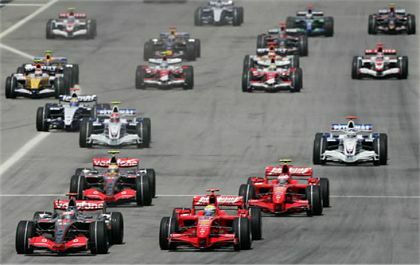 Listen to any large group of F1 fans and you will hear the same story: we want more overtaking, closer competition between drivers and fewer processional races. Two aspects of car design are most often blamed for the dreary predictability of modern GPs - aerodynamics and driver aids. In general, the FIA agrees with this assessment and hence this year's ban on traction control. But the engineers and designers see things rather differently, it would seem. Three of them have made statements that show their dislike of the new rules, complaining that they limit their freedom to introduce new ideas. And one can see that they have a point; their job is to be forever pressing forward in a search for innovations that will give their team an edge over others; any limit put on that must be very galling for them. It is an interesting insight into the mind of the engineer, however. Suddenly one begins to understand that they are more interested in the car than the driver and their sense of achievement must come from seeing their design cross the finish line first, regardless of who happens to be driving it. This is how it should be - their apparently narrow field of focus is essential if they are going to be any good at their job at all. But imagine a Formula One in which the engineers set the rules. We would have technical marvels capable of lapping so quickly that it is doubtful that any human could drive them, so great would be the G-forces in the corners. So a balance between the drive for technical advance and the skill of the driver is essential for the sport to survive. And the weakness of the engineers' argument is revealed in their own statements. "The new rules (the ban on traction control and the standard ECU) are so restrictive that there is no longer room for groundbreaking developments." There is some truth in this - but it ignores the fact that traction control is no longer groundbreaking. It has been around for years and the consensus is that it takes away too much of the responsibility of the driver to control his car. If it levels out the difference in skills between drivers, enabling an average driver to compete with a gifted one, it is ruining the whole point of F1 - which must always be competition between both engineers and drivers. Were Mr Costa talking of the restricted engine rules and the ten year freeze, I would agree with him. Limiting the engine to a set format of gasoline-fueled V8s for the next decade is far too restrictive and ensures that engine designers might as well take a sabbatical until 2017. But traction control is another thing entirely; it has been tried, developed and is going no further, beyond minimal improvements that might shave a thousandth of a second off lap times. For the engineer interested in new ideas, it is old hat and no longer worthy of development. So, when Luca Baldiserri says, "Technically, we have gone backwards ten years", he is quite right - but fails to see that this is not necessarily a bad thing. There was a groundswell of opinion back in 1997 that F1 races were too predictable and processional (in fact, it has been the common complaint for over twenty years), but it was nowhere near as loud and desperate as the cries we hear today. Traction control has made things worse, not better, and a return to the world of ten years ago is a step in the right direction: backwards, yes, but to a better future for the sport. I suspect that the engineers' complaint is so badly-aimed and timed because it is a case of the straw that broke the camel's back. Had the engineers been more awake to what was happening in F1 in the recent past, they would have protested the introduction of the standard ECU when it was first proposed and the idea of a ten-year freeze on engine development would have had them all out on strike. To whinge about the TC ban is a matter of too little, too late; there is no sense in kicking against so popular a change when far greater and more restrictive measures have been allowed through without comment. So I have little sympathy for the engineers - they are late in realizing how their jobs are threatened by the FIA's determination to cut costs by restrictive rules and they must bear the consequences. Ever since the introduction of ground effect by the greatest of them all, the engineers have ruled the roost in F1, accelerating development to the point where driving skills have become almost irrelevant. Let us not care too much when they begin to squeal at the curbing of their powers. "From the middle of the season, from a technical point of view, F1 will be essentially a single formula." Huh? Is it a double or multiple formula at present? What the heck does that mean, anyway? But I suppose it does illustrate another thing about engineers that we would be wise to remember: they are not usually the best communicators in the world! Single formula in this case probably refers to the idea that there will no longer be easily-defined gaps between clusters of teams, as has been the case for most of F1's history. There'll still be front-runners, mid-fielders and back-markers, but they'll all be in touch with their closest rivals instead of anyone being able to float around in a race of their own. Well, I think that's what Ross Brawn's trying to say. I think he must have been on a no-banana strategy today. That would be my guess, Mary-Ann - but it's a funny way to say it, isn't it? Mary-Ann Horley: Does he mean that all the cars will be the same? If you want to see what "all the same" looks like have a read through the technical sections of the FIA F1 regs, they actually specify the materials to be used, the maximum bore size, etc. If I were one of those fabled F1 engineers I'd have a hard time trying to come up with ANYTHING new. Remember when Renault tried the 111 degree Vee .....that was a big deal, today the V-8 is specified to be 90 degrees, only. The cars are slowly becoming "spec racers" which in the long run does make driver input more of a factor, but.......this is supposed to be "The pinnacle of motorsport" and technology is part of the sport. You're right Clive. Engineers complaining about the TC ban but not breathing a word on the engine freeze is just polishing the ashtrays on the Titanic. Perhaps they have been gagged? FIA regs to: 600kgs, 2.0 litres, 300 kms .... the first one to finish WINS! Maybe a couple amendments for turbines and supercharging, but the lack of restraint would return innovation, interest and excitement to the sport again. That sounds like good sense to me, Number 38. Ever thought of running for president of the FIA? Exactly, Alan. But it will hardly be F1, will it?